Indiamart IPO Review, Subscription, Allotment, GMP. Company primarily operate through their product and supplier discovery marketplace, www.indiamart.com or “IndiaMART”. IndiaMART is an online marketplace provides a platform for mostly business buyers, to discover products and services and contact the suppliers of such business products and services. Company’s online marketplace is accessible through desktop and mobile-optimized platforms and apps on personal computing and mobile devices. 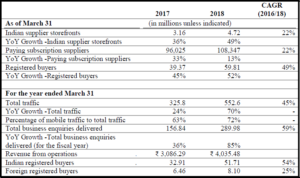 As of March 31, 2018, Company had 59.81 million registered buyers, and they had 4.72 million supplier storefronts in India. IndiaMART provides a robust two-way discovery marketplace connecting buyers and suppliers. Buyers locate suppliers on the marketplace, including both Indian small and medium enterprises, or “SMEs”, and large corporates, by viewing a webpage containing the supplier’s product and service listings, or a “supplier storefront”, or by posting requests for quotes called “RFQs” or “BuyLeads”. The Indian supplier storefronts had listed 50.13 million products, of which 75% of goods comprised products and 25% were services. A total of 156.84 million business enquiries were delivered to IndiaMART suppliers in fiscal 2017 and 289.98 million business enquires were delivered in fiscal 2018. In the past three years, Company has experienced significant growth in the number of suppliers and buyers on IndiaMART and in the revenue. How does IndiaMart make Money? 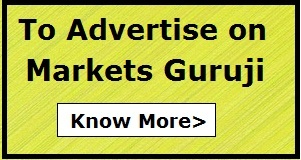 Company earn revenue primarily through the sale of subscription packages (available on a monthly, annual and multiyear basis) to suppliers, which offer a range of benefits including the listing of their supplier storefronts on a priority basis on IndiaMART, access to lead management system, integrated access to third party online payment gateways and access to RFQs. They also earn revenue through advertising on IndiaMART desktop and mobile optimized platforms and IndiaMART mobile app, payment facilitation service and from the sale of “RFQ credits”. How many Paying Suppliers does the Company have? As of March 31, 2018, Company had 108,347 paying subscription suppliers on IndiaMART platform. The suppliers on IndiaMART include Indian SMEs and large businesses who are manufacturers, wholesalers, exporters and retailers. Who are the Competitors for IndiaMart? IndiaMart faces competition in attracting and retaining suppliers and buyers from a number of competitors, both in India and internationally.These competitors include Indian online B2B marketplaces, foreign B2B online marketplaces. IndiaMart’s strong Network & Brand Recognition drives Leadership in the B2B marketplace in India. IndiaMART is India’s largest online B2B marketplaces for business products and services with approximately 60% market share of the online B2B classifieds space in India. As of March 31, 2018, IndiaMART provided 59.81 million registered buyers with access to 4.72 million supplier storefronts in India which list 50.13 million products and services across 52 industries. Diverse Industry and Product and Service Categories. IndiaMart offers a comprehensive breadth and quality of listings across a wide spread range of industries. Company’s products and services are spread across 52 industries rather than relying on a single target industry. As of March 31, 2018, Company’s online marketplace had a total of 50.13 million listed products, of which 75% comprised products and 25% comprised services. Operations Spread Across Diverse Geographies. Company’s products and services are spread across India rather than relying on a single geography. Although 39% and 50% of buyers and suppliers are respectively derived from the top 8 metro cities in India, namely Delhi NCR, Mumbai, Bengaluru, Hyderabad, Kolkata, Ahmedabad, Pune and Chennai. Company’s marketplace offerings also generate traffic from second and third tier cities representing more than 1,000 cities. Company does not have any listed peer group companies in India. Hence we cannot make any Comparison.